The Zilwaukee Bridge is a...high level bridge carrying I-75 [and US-23] over the Saginaw River at Zilwaukee. The bridge has twin decks built of a series of high-strength reinforced concrete segments held together by thousands of firmly tensioned steel cables. The mile-and-a-half long bridge replaces an outmoded, inadequate drawbridge that caused backups on the freeway every time it opened for river traffic. Of course, for many Michiganders, the Zilwaukee Bridge evokes a response harkening back to a major construction accident while bridge was not yet half completed in the early-1980s which added many millions to the cost and years to the completion. However, let's step back in time to the genesis of the crossing in the first place. The origin of today's Zilwaukee Bridge can be traced back to the original two-lane highway bypass on the east side of the City of Saginaw completed in 1953. Prior to that, all through traffic in the Saginaw area was funnelled through downtown via US-10 and US-23. In the early-1950s, the Michigan State Highway Department constructed a new eastern bypass of Saginaw for through US-23 traffic, beginning at the existing route (Dixie Hwy) in Bridgeport, continuing northerly to meet back up with US-23 (present-day M-13) northeast of the city. While no Saginaw River crossing seems to have been planned at that time, the 1953 bypass would become part of a much bigger project later in the decade. With the coming of the Interstate Highway System in the late-1950s, the earlier two-lane highway of Saginaw was incorporated into the new Interstate highway running from Detroit to the Mackinac Bridge. In 1960, the first portion of the new route in the Saginaw area was opened to traffic. It consisted of the new four-lane, double-leaf bascule (draw) bridge and a freeway beginning at the northern end of the 1953 bypass (at present-day M-13), crossing the bridge and continuing northerly toward Bay City. This was part of the I-75/US-10/US-23 freeway. By the end of the next year, the original 1953 US-23 bypass had also been converted to full freeway with overpasses and interchanges at the intersecting roads. While it may have seemed like a good idea in the late-1950s, soon after the opening of the (original) Zilwaukee Bridge in 1960 it became clear the crossing would cause more problems then it solved. While the most obvious problems concerned the massive traffic tie-ups on the freeway each time the bridge opened, it also caused problems for traffic on the Saginaw River as well. The bridge was only 150 feet wide and several ships actually hit the bridge, causing damage and additional tie-ups on the freeway as well. Top top it off, shipping traffic actually quadrupled in the years after the bridge was completed and the back-ups on the freeway reached three to four hours in duration and often up to 30 miles in length. The worst back-ups, of course, occurred during major holiday weekends and during the fall hunting season. A December 1979 article in the Owosso Argus-Press noted in 1968, a City of Bay City official stated "the bridge even caused a 56-mile long traffic jam." Less than fifteen years after the original bascule bridge was opened, the decision came to replace it with a high-level bridge. This only after other ideas had been batted around, including a tunnel under the river and reconstructing the newly-completed I-675 loop through downtown as the through route. The final bridge design selected and constructed is a post-tensioned, segmental, box girder bridge and work on the new structure commenced in late-1979 and was projected to cost approximately $77 million (not counting approaches and ramp work). As noted above, when the bridge was approximately half-complete, a major construction accident halted all work in August 1982. Much more on the accident, what caused it and what was done to remedy the situation can be found in Section 4: The Accident in The Zilwaukee Bridge: From the Beginning. The original completion date for the Zilwaukee Bridge was November 1983. However, due to the accident and its subsequent repair work, construction on the bridge did not resume until late 1984 under a new contract with a new contractor. On Tuesday, September 22, 1987 the final 117-ton piece of concrete was installed on the bridge and the northbound lanes of the I-75/US-23 freeway were routed over the bridge for the first time on Wednesday, December 23, 1987—a nice Christmas present, four years after the bridge was to be completed. Almost exactly nine months later, the southbound side of the bridge was opened to traffic on Monday, September 19, 1988. The original bascule bridge was permanently closed on that date—but only to automobile traffic. The bridge operator continued to staff the bridge until it was removed so that river traffic would not be impeded. According to a story posted to the USENET newsgroup alt.great-lakes the deck of the old drawbridge now rests on the bottom of Lake Huron as a fish habitat. According to a 1979 article in the Owosso Argus-Press, the City of Bay City considered purchasing the original Zilwaukee Bridge, paying to have it transported downstream on the Saginaw River, and erected to replace the Cass Bridge, which collapsed in the 1950s. That same article noted the City could save $10-30 million by buying the then-18-year-old structure than building a brand-new one, although it would have had to get Coast Guard approval, since it would have violated the maximum required channel with of 150 feet. While the bridge has performed very well in the years since it has opened to traffic, the bad news did not stop even after motorists had been using the span for more than a year. While the remaining ramp connections were being completed at either end of the new bridge, it was discovered one of the unfinished ramps crossed a buried landfill contaminated with PCBs. In an August 22, 1989 article, The Detroit Free Press noted "Containing and removing the toxic polychorinated biphenyl will cost at least $100,000 and could delay completion of the ramp, now scheduled to open this year. In April 2008, a scheduled $3.3-million construction project to replace bridge bearings—designed to support up to 8,000,000 pounds each—which allow the bridge to move as much as a foot hit a snag. Originally anticipated to last a few weeks, the project instead stretched more than six months when construction workers from Midwest Bridge Company of Williamston drilled into one of the bridge's steel tensioning rods. Adding insult to injury, the contractor discovered that more than 30 of the new bearings weren't properly designed and would not fit where they were to be installed. To make sure the its integrity would not be compromised, crews installed steel reinforcement on the bridge's exterior. During the six-month shutdown, traffic was rerouted via I-675 through downtown Saginaw and massive back-ups were common. Traffic began using the Zilwaukee Bridge again on October 1, 2008. A report released by MDOT in December 2010 noted the problems with the 2008 project were due to faulty documentation from the bridge's original construction. "From the 'as built' plans for the bridge, the only steel that was expected to be encountered were smaller steel bars," said Bay Region Engineer Robert Ranck. "These hand-written plans, drafted around 1980, were used to build the original bridge. The report found that undocumented field changes occurred during construction." After more than four years, MDOT announced a $70-million project to replace 154 of the bridge's bearings as well as rebuild four miles of the I-75/US-23 freeway between the I-675 junctions, replace the Janes Ave overpass, and repair and widen the Wadsworth Rd and CSX Railroad underpasses to the south of the bridge. The project ran from April 2013 through 2015. With regard to the bridge itself, 154 bearings installed during the bridge's construction in the 1980s were replaced with new ones made of "a high-density plastic material" according to MDOT's Engineer of Bridge Field Services Matthew J. Chynoweth. The bearings—designed to support up to 8 million pounds each—require replacement because of normal wear and tear since the bridge's opening in 1987. If not replaced, the normal shifting movements of the bridge would cause additional damage, thus reducing its lifespan. Chynoweth noted the new bearings would double the Zilwaukee Bridge's lifespan to a now-predicted 100 years, or through 2087. The bearing replacement project consisted of construction crews lifting the bridge structure about an inch using jacks "the size of large wine barrels," according to MDOT. Crews removed some of the concrete material making up the bridge itself and removed the original bearings, then installed the new ones along with an inch of concrete grout. Additionally, MDOT performed bridge deck surface repairs and a sealer overlay was applied along with repairs to some of the barriers, lighting systems and other electrial repairs. Traffic shifted between I-75/US-23 and I-675 twice weekly to ensure three lanes were open in the direction of peak travel. Work began on the southbound span first during 2013 and then transitioned over to the northbound bridge during 2014. Zilwaukee Bridge: Aerial Image - color infrared aerial imagery of Zilwaukee Bridge, 1998. Zilwaukee Bridge: Annotated Aerial Image - color infrared aerial imagery of Zilwaukee Bridge, 1998, annotated and indicating former alignment of I-75/US-10/US-23 freeway and location of original bascule span in relation to present sturcture. 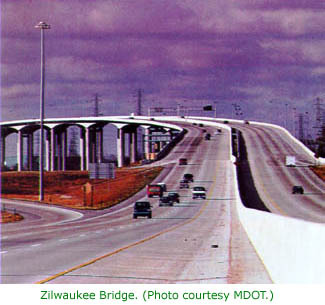 The Zilwaukee Bridge: From the Beginning - a 1987 report on the bridge from the Michigan Department of Transportation. I-75 and Zilwaukee Bridge Improvements: Construction and Motorist Information - the MDOT project brochure for the October 2012—April 2015 bearing-replacement project. MDOT Releases Z-bridge report findings - from MDOT, regarding the 2008 bearing-replacement construction mishap. Photography of Jason Hill: Zilwaukee Gallery (archived at archive.org)- contains some interesting shots of the bridge. My personal favorite. Michigan in Pictures: The Zilwaukee Bridge - photos by Mario Q. From boondoggle to boon, Zilwaukee span serves state well - by Marty Mulcahy in The Building Tradesman online newspaper. Zilwaukee Bridge Construction Engineering - from OPAC Consulting Engineers.